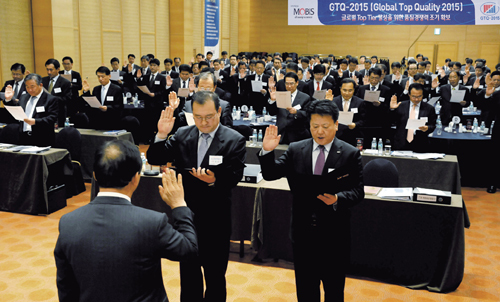 Hyundai Mobis has unveiled a plan to chalk up 26 trillion won in sales in Korea and abroad during 2011 with the goal of joining the global top 10 automotive parts makers club. The company announced its 2011 business goals on Jan. 18: posting 26 trillion won in sales ― 14 trillion won in Korea and 12 trillion won from abroad ― a 23.8 percent surge from 2010, and being among the global top 10 automotive parts makers. On top of each division’s business plans, Hyundai Mobis disclosed the top management guidelines: ramping up the capacity of core future growth engines, upgrading global management and strengthening sustainable growth forces. Since 2000, when its name changed to the current one, Hyundai Mobis saw its sales soar from 2.934 trillion won to 17.23 trillion won in 2009 on a consolidated financial statement basis and its stock value rise from 400 billion won to approximately 29 trillion won. The company ranked 12th among global automotive parts makers last year. The Korean automotive parts leader plans to climb higher with its top three management guidelines and invest 1.15 trillion won during this year to devote itself to attaining the goal of entering the global top 10 automotive parts makers club. In the R&D sector, Hyundai Mobis is implementing a program to nurture its automotive parts into the world’s top-rated ones. The company plans to expand manpower and facilities for research of the target items, which will be determined by May, in order to increase its market share. It will attach a research focus on leading and mass production technologies of brake items, airbags and the environmentally-friendly segments during this year. To this end, Hyundai Mobis set aside 360 billion won for its R&D budget, while the research staff, primarily comprising of researchers from mechanical and industrial engineering fields, is to be diversified to the software, electronics, IT and mechatronics sectors. A new research wing will be built by 2012 to complete a system to test and evaluate almost all automotive parts, including hybrid, automotive electronics and brakes. Hyundai Mobis is striving to aggressively expand its overseas business horizons by capitalizing on its technological prowess in the field. In an effort to attain the 2011 goal of raking in $1.5 billion in sales in the overseas business sector, the company is coming up with strategies to develop strategic products tailored to meet the needs of each region, to set up localized marketing regimes and focus its R&D capacity to make inroads into the Chinese market and to secure new clients by participating in automotive parts shows. In particular, the company has devoted itself to establishing strategies in the automotive electronics segment in which sector-by-sector barriers have been crumbling and technological convergence between vehicles and mobile IT technologies has been expanding. Experts project that the unit cost portion of automotive electronics parts per vehicle will likely surge from the current 20 percent to 40 percent in 2015. Hyundai Mobis, which has stepped up efforts to develop its own systems and environmentally-friendly and IT-linked items, aims to earn 2.5 trillion won in sales in the automotive electronics sector in 2011, a 20-percent jump from 2010, by focusing on three axes ― intelligent systems, environmentally-friendly technology and IT convergence. Hyundai Mobis faces fierce competition from such global leaders as Bosch, Denso and Continental, which have expanded their presence in the emerging markets and made massive investments in core growth sectors, but experts agree that the company could attain the target by publicizing its own technology’s strong points. Hyundai Mobis was recognized for its technological prowess by supplying automotive electronics and core parts to BMW, Daimler, Volkswagen and GM during last year. Study reports posted by global database firms showed that the global automobile manufacturing industry is likely to grow thanks to the global economic recovery as worldwide sales of automobiles are predicted to rise from 69.7 million units in 2010 to 75.8 million units in 2011. Aside from the existing new markets such as China and India, emerging markets such as Mexico, Australia, Vietnam and other countries, dubbed “MAVINS,” are predicted to be the new targets for global automakers to scramble for control over. In this regard, in the module production segment, the company plans to concentrate on expanding global production centers in order to back up Hyundai Motor and Kia Motors’ goals to produce and sell 6.33 million units on a global basis. Hyundai Mobis will ramp up the competitiveness of its products by reinforcing independent management systems of localized plants in the existing markets, including the United States, India and European countries, while pushing ahead with projects to build a plant in Brazil by 2012 and construct a third plant in China. Hyundai Mobis’ staff representatives pledge to do their best to realize the “Global Top Quality 2015” vision at a management strategy seminar.